Singapore (AP) — Lewis Hamilton had been worried about how many points he would lose to Sebastian Vettel at the Singapore Grand Prix. It was supposed to be a damage limitation exercise for Mercedes after a poor performance in qualifying. 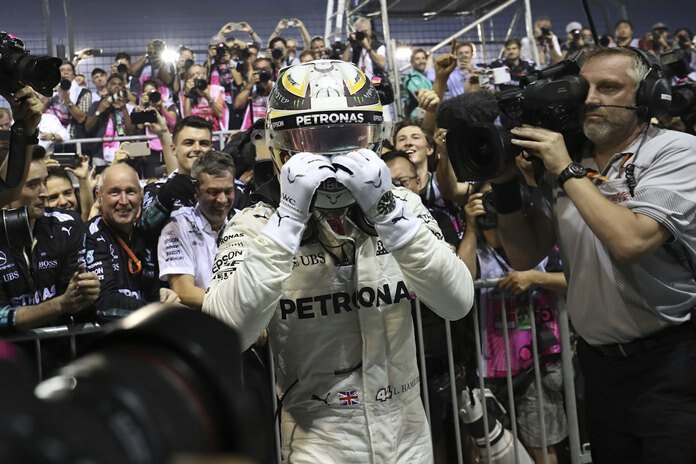 Instead, Hamilton took a significant stride toward the world title after winning Sunday’s race from fifth place on the grid. Red Bull’s Daniel Ricciardo prevented a Mercedes 1-2 by finishing ahead of Valtteri Bottas. Fourth place went to Toro Rosso’s Carlos Sainz Jr. — a career best for the Spanish driver. Vettel made one of the worst starts of his distinguished career, throwing away pole position as he recklessly caused a crash heading into the first corner. The Ferrari driver took three others out with him — and critically none was a Mercedes. Instead of moving ahead of Hamilton in their enthralling title battle, Vettel now trails him by 28 points with six races left. Vettel was supposed to score heavily here. With less speed and 23 turns, the hard-braking Marina Bay circuit suited Ferrari much more than Mercedes. This was further reflected in qualifying, with Bottas sixth and Ferrari’s Kimi Raikkonen starting fourth. Furthermore, Vettel had the Singapore record for wins (four) and podiums (six). But in a few seconds, he threw it all away. The German driver gunned across the track, triggering first-turn mayhem and causing a domino effect as Raikkonen, Red Bull’s Max Verstappen and McLaren’s Fernando Alonso all crashed with him. On one of the toughest tracks in Formula One for overtaking, Hamilton would have been pleased with a podium finish. Instead, the field opened up perfectly for the British driver to seal his third straight win, seventh of the season and 60th overall. Following a massive downpour several hours beforehand, more heavy showers soaked the circuit just before the race which started 8 p.m. local time. After a hesitant start, Vettel veered hastily left as he tried to counter Verstappen’s strong start. It was a needless move so early on, and squeezed Verstappen and Raikkonen for room, causing them to collide on the inside. Vettel’s recklessness was even more pointless, because Verstappen is not in the title race. Raikkonen’s wobbling car tagged Vettel’s before spinning across the track, careering spectacularly into Verstappen and Alonso. Stewards summoned Vettel, Raikkonen and Verstappen to a meeting after the race, but no further action was taken. Hamilton stayed left, picking his spot, and avoiding any danger as he moved into the lead. After a few laps behind the safety car, the race resumed for real on lap 7. Vettel was already in the garage contemplating the heavily damaged front wing and left of his car. After apologizing to his team, the four-time F1 champion tried to explain himself. Verstappen, who had started from second on the grid ahead of Ricciardo, blamed Vettel. Vettel and Verstappen were involved in heated incidents last season, and the ill feeling still seems to linger. Alonso, meanwhile, bravely continued but retired on lap 9. “The car was completely destroyed on the left side,” the Spaniard said. The safety car came out again shortly after, as Daniil Kvyat crashed his Toro Rosso. By the next re-start on lap 15, Ricciardo had changed tires, but Hamilton hadn’t. Hamilton eventually changed them on lap 30 of 61, and timed it right as he was a healthy nine seconds ahead of Ricciardo afterward. Marcus Ericsson stalled his Sauber on lap 39, bringing the safety car out again — which irritated Hamilton. This is because safety cars stop the leader’s momentum, allowing others to close the gap. Now Vettel is the one who must do that at the Malaysian GP in two weeks’ time.